Funding This work was supported by National Heart, Lung, and Blood Institute grant HL068835 (to A.E. Mast) and the Herma Heart Center at Children's Hospital of Wisconsin. Background Neonates undergoing cardiopulmonary bypass (CPB) surgery to correct congenital heart defects often experience excessive bleeding. Exposure of blood to artificial materials during CPB may activate coagulation, complement and inflammatory pathways. In addition, the surgical stress placed on the haemostatic system may result in cross-activation of other plasma proteolytic cascades, which could further complicate physiological responses to the surgical procedure and post-operative recovery. Plasma protease inhibitors undergo distinct conformational changes upon interaction with proteases, and, thereby, can serve as endogenous biosensors to identify activation of the different proteolytic cascades. We tested the hypothesis that changes in the concentration and conformation of protease inhibitors regulating plasma proteolytic cascades during neonatal CPB are associated with post-operative bleeding. Patients and Methods Plasma samples from 44 neonates were obtained at four time points across the surgical procedure. Anti-thrombin, antitrypsin, anti-chymotrypsin, anti-plasmin, C1-inhibitor and tissue factor pathway inhibitor (TFPI) concentrations and conformations were evaluated by enzyme-linked immunosorbent assay, transverse urea gradient gel electrophoresis and sodium dodecyl sulphate-polyacrylamide gel electrophoresis. Results/Conclusion The most striking changes were observed following heparin administration and were associated with the appearance of inactive forms of anti-thrombin and an increase in the plasma concentration of TFPI. Changes in anti-thrombin and TFPI remained evident throughout surgery and into the post-operative period but were not different between patients with or without post-operative bleeding. The concentration of antitrypsin decreased across surgery, but there was no significant accumulation of inactive conformations of any inhibitor besides anti-thrombin, indicating that widespread cross-activation of other plasma proteolytic cascades by coagulation proteases did not occur. Cardiac surgery is a common cause of severe bleeding in neonates. Cardiopulmonary bypass (CPB) is routinely used to isolate and support the cardiopulmonary system during complex cardiac procedures and places different stressors on neonatal haemostasis than occur in adults undergoing CPB. These include a larger relative prime volume, obligate use of donor blood and more extensive haemodilution of plasma proteins. The neonatal haemostatic system also undergoes multifactorial change during CPB, including alterations of platelet number and function,   dilution of plasma growth factors, such as thrombopoietin, and alteration in plasma coagulation proteins. The neonatal haemostatic system is altered during CPB by transfusion of blood products collected from adults and teenagers to prime the bypass pump and treat surgical bleeding. Maternal coagulation proteins do not cross the placenta, and therefore, the plasma concentrations of neonatal coagulation proteins tend to be lower than in adults. Pro-coagulant factors II, VII, IX, X, XI and XII are particularly low at birth, ranging from 30 to 50% of adults. Anticoagulant plasma proteins, protein C, protein S, and anti-thrombin are also below 50% of adult concentrations at birth,  producing some balance between the pro- and anticoagulant potential of neonatal plasma. Likewise, neonatal concentrations of proteins modulating plasma protease cascades including C4b-binding protein and plasminogen are reduced. Transfusion of blood products to prime the bypass pump and maintain haemostasis shifts the neonatal circulation towards that of an adult, which alters the balance between pro- and anticoagulant proteins in neonatal plasma. This balance is further altered by heparin administration during CPB, and its subsequent reversal with protamine. Exposure of blood to artificial materials in the bypass pump can cause contact activation of plasma coagulation, complement and inflammatory cascades. Tissue factor-dependent coagulation and inflammation, as a result of monocyte activation and surgical trauma, also occur during CPB. In addition, coagulation proteases can cross-activate other plasma proteolytic cascades and vice versa. Thus, the neonate undergoing CPB is susceptible to widespread and unregulated proteolysis with consumption of plasma protease inhibitors that regulate blood coagulation, fibrinolysis, complement and inflammation. Members of the serpin superfamily of protease inhibitors undergo large and distinct conformational changes when they interact with proteolytic enzymes. These occur through structural transition of the active site loop as it partially or fully inserts into a large β-sheet, altering thermodynamic stability of the serpin. Serpin conformations include the virgin form, which is the active inhibitor and is cleared slowly from plasma; the cleaved form, in which the reactive site loop is proteolytically inactivated and also is cleared slowly from plasma; and the protease-complexed form, which is an equimolar complex of the serpin and a target protease and is more rapidly cleared from plasma. We sought to utilize serpin conformational changes that occur during neonatal CPB as ‘endogenous biosensors’ to detect activation of the different plasma proteolytic cascades during the surgical procedure. To this end, we examined the concentration and the conformational stability of the serpins anti-thrombin, antitrypsin, anti-chymotrypsin, anti-plasmin and C1-inhibitor, as well as the Kunitz-type protease inhibitor, tissue factor pathway inhibitor (TFPI), in plasma samples obtained at different time points across the course of neonatal CPB surgery and correlated the measurements with bleeding outcomes. Neonatal patients requiring cardiac surgery with CPB were enrolled after obtaining informed parental consent. Exclusion criteria were birth weight under 2.5 kg, known inherited haemostatic abnormality, extracorporeal membrane oxygenation at the time of surgery or history of previous CPB. The study was approved by the Children's Hospital of Wisconsin Institutional Review Board. Blood was collected from arterial lines that were infused with 1 unit/mL heparin at 1 to 2 mL/hour to prevent blood from clotting in the line. Before each blood sample collection, the first 1 to 2 mL of blood was discarded to remove the heparin in the line before drawing the test sample. Blood was collected into 3.2% sodium citrate at four time points. The samples were as follows: baseline, admittance to the operating room; on-CPB, following heparin administration and the start of CPB, aortic cross-clamp removal and prior to platelet or cryoprecipitate transfusion; post-CPB, after patient removal from CPB, completed rewarming and protamine administration; and post-op, upon cardiac intensive care unit admission. Each sample was 0.5 mL whole blood which was transported to the research laboratory, spun at 2,500 × g for 10 minutes at 25°C, and plasma stored at –80°C. Bypass pump prime (450 mL) was administered as fresh whole blood (< 2 days storage) or a 1:1 ratio of packed red blood cells (PRBCs) and fresh frozen plasma (FFP) when fresh whole blood was not available. All neonates received tranexamic acid as a 30 mg/kg loading dose, followed by 10 mg/kg/hour infusion to inhibit fibrinolysis during surgery. In addition, 0.1 mg/mL tranexamic acid was added to the CPB prime. Heparin was dosed to maintain the activated clot time above 480 seconds. An institutional transfusion strategy for neonatal congenital cardiac surgery with CPB was applied throughout the study. Immediately prior to termination of CPB, all neonates received one-fourth unit of single donor apheresis platelets and 1 unit of cryoprecipitate. After CPB, protamine, one-fourth unit of the same single donor apheresis platelets and PRBCs were administered. Beyond this uniform protocol, neonates were transfused to maintain haematocrit above 35%, platelet count over 100 × 10/µL and fibrinogen above 200 mg/dL. Modified ultrafiltration was performed uniformly in all neonates at the end of CPB. A standardized definition of post-operative bleeding was used as follows: total chest tube output ≥ 84 mL/kg during the first 24 post-operative hours (≥ 3.5 mL/kg/hour average); ≥ 7 mL/kg/hour chest tube output for ≥ 2 consecutive hours during the first 12 post-operative hours; and re-exploration for bleeding or cardiac tamponade physiology during the first 24 post-operative hours. Fibrinogen was measured using the STA Fibrinogen 5 Kit and D-dimer was measured using the STA Liatest D-Di (Diagnostica Stago, Inc, Parsippany, New Jersey, United States). Plasma total protein was measured using the bicinchoninic acid protein assay (ThermoScientific, Waltham, Massachusetts, United States). Enzyme-linked immunosorbent assay (ELISA) assays measured the plasma concentrations of anti-thrombin, antitrypsin, anti-plasmin, C1-inhibitor and TFPI. Serpin assays were performed as recommended by the manufacturer, C1-inhibitor and anti-plasmin (Sino Biological, Beijing, China); and antitrypsin and anti-thrombin (Enzyme Research Laboratories, South Bend, Indiana, United States). TFPI ELISA assays measuring total TFPI and TFPIα were developed in our laboratory. The results of the assays were recorded as % adult normal plasma, based on comparison to the normal pooled plasma control tested on each plate. Transverse urea gradient (TUG) gels containing 7% polyacrylamide and a continuous horizontal linear 0 to 8 M urea gradient within an ammediol buffer system were performed under non-denaturing conditions. Each gel was loaded with 5 µL of plasma diluted into 145 µL sample buffer. Proteins were visualized by Western blot. Plasma TFPI ligand pull-down using factor Xa (FXa) beads were performed as previously described. Briefly, FXa beads was added to 50 μL of plasma, rotated at 4°C for 1 hour and washed with phosphate-buffered saline (PBS) 0.05% Tween-20 followed by PBS. Washed beads were boiled in sodium dodecyl sulphate (SDS) sample buffer and the supernatant was loaded onto a 4 to 20% continuous gradient SDS-polyacrylamide gel electrophoresis (SDS-PAGE) gel. Proteins separated on the TUG or SDS-PAGE gels were transferred to polyvinylidene difluoride (TUG) or nitrocellulose (SDS-PAGE) membrane at 400 mAmps for 1 hour. The membranes were washed in PBS, blocked for 1 hour and incubated overnight at 4°C with polyclonal antibodies against antitrypsin (Millipore, Temecula, California, United States), anti-plasmin (Sino Biological), anti-chymotrypsin (Proteintech, Chicago, Illinois, United States), anti-thrombin (Enzyme Research Laboratories) and C1-inhibitor (Cedarlane, Burlington, North Carolina, United States), then washed and probed with secondary antibodies for 1 hour at room temperature. Blots were imaged using a LI-COR Odyssey Imaging System (Licor, Lincoln, Nebraska, United States). To account for repeated measures within each subject, a generalized estimating equation with an autoregressive covariance structure was used to compare bleeders and non-bleeders. Either a normal distribution with identity link function or a gamma distribution with log link function was specified depending on the outcome. A Bonferroni step-down (Holm) correction method was used to adjust for multiple comparisons. A p-value of < 0.05 was considered as statistically significant. SAS 9.4 was used for the analyses. This prospective observational study enrolled 44 term neonates < 30 days of age (median: 7.0 days) undergoing surgical repair of congenital heart defects with CPB. There were 20 females and 24 males with median weight of 3.3 kg. The cohort had a mean Risk Adjusted Classification for Congenital Heart Surgery-1 (RACHS-1) score of 4, reflecting high complexity of the cardiac procedures. Of the 44 neonates, 16 (36%) met the criteria for post-operative bleeding. Population comparisons were performed between the non-bleeder and bleeder groups ([Table 1]). There were no differences found in age at surgery, birth weight or height or total time on CPB. There were no difference in RACHS-1 score, and the number of each procedure type by group is presented in [Table 1]. There were no differences in baseline platelet count, haematocrit, pro-thrombin time, activated partial thromboplastin time, time on CBP, heparin level while on CPB or the initial protamine administered to reverse heparin between groups. The bleeder group experienced more chest tube output in the first 24 hours following surgery (294 vs. 115 mL). The bleeder group was given approximately twofold (330 vs. 152 mL) more average total combined volume of blood products (FFP, PRBC, platelets, cryoprecipitate) during surgery than was the non-bleeder group. This difference was largely accounted for by greater amount of PRBC (p = 0.0009) and FFP (p = 0.002) transfused in the bleeder group, while amounts of platelet and cryoprecipitate were equal between groups ([Table 1]). Abbreviations: AP, aortopulmonary; aPTT, activated partial thromboplastin time; ASD, atrial septal defect; ASO, arterial switch operation; CPB, cardiopulmonary bypass; DORV, double outlet right ventricle; FFP, fresh frozen plasma; FP, frozen plasma; FPRBC, frozen packed red blood cell; IAA, interrupted aortic arch; PRBC, packed red blood cell; PT, pro-thrombin time; RACHS-1, Risk Adjusted Classification for Congenital Heart Surgery-1; TAPVR, total anomalous pulmonary venous return; TOF, Tetralogy of Fallot; VSD, ventricular septal defect; WB, whole blood. Blood products collected from adults and/or teenagers were used to prime the bypass pump in amounts exceeding the total blood volume of the neonate. This increased the total plasma protein concentration across the surgical procedure ([Fig. 1]). Baseline plasma protein averaged 60% than that of adults, increased to 89% on-CPB, further increased to 98% post-CPB and then decreased to 83% post-op. Despite differences in amounts of blood products transfused, there was no difference in plasma total protein between the bleeder and non-bleeder groups at any time point. Since the change in the concentration of each individual protein is associated with the change in total plasma protein concentration, the individual protein concentrations were modelled adjusting for the amount of total plasma protein in statistical analyses. However, the results of these analyses indicated that total plasma protein was not a confounding variable for changes observed in the concentration of individual plasma proteins. Fig. 1 Total plasma protein of the neonate increases upon transfusion of blood products at the beginning of surgery. 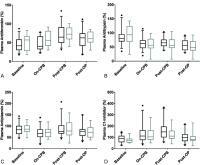 Box and whisker plots for total plasma protein at the four surgical time points as per cent adult plasma are presented. The central line represents median, the boxes range from 25th to 75th percentiles, the whiskers extend from the 5th to 95th percentile and the dots depict outliers. There were no differences between the non-bleeder (black bars) and bleeder groups (grey bars) at any time point. Fibrinogen consumption and elevation of D-dimer suggest activation of coagulation and fibrinolytic cascades and have been related to the propensity for bleeding during paediatric CPB. Average plasma fibrinogen was above 200 mg/dL at baseline and remained near or above this level throughout surgery in both the non-bleeder and bleeder groups as per the surgical transfusion protocol ([Fig. 2A]). There were no differences in fibrinogen between the two groups. Plasma D-dimer was elevated at baseline, consistent with previous reports of neonates with congenital heart defects. 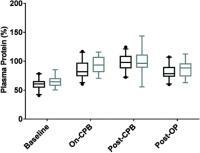 It decreased from baseline at the post-CPB and post-op time points (p < 0.0001), perhaps reflecting dilution following transfusion or inhibition of fibrinolysis by tranexamic acid ([Fig. 2B]). D-dimer was not measured at on-CPB due to interference from the high amounts of heparin present in the samples. There were no differences in D-dimer between the non-bleeder and bleeder groups at the three time points measured. Fig. 2 Change in fibrinogen and D-dimer across surgery. Box and whisker plots as described in [Fig. 1] for fibrinogen and D-dimer concentration at the four surgical time points in the non-bleeder (black bars) and bleeder (grey bars) groups are presented. (A) Fibrinogen decreased from baseline to on-cardiopulmonary bypass (CPB), p = 0.0005 for non-bleeder; p = 0.0041 for bleeder. At post-CPB and post-op, fibrinogen increased compared with on-CPB, p < 0.0001 for non-bleeder at both time points; p < 0.0001 and p = 0.0009 for bleeder at post-CPB and post-op, respectively. (B) D-dimer decreased at post-CPB and post-op compared with baseline, p < 0.0001 for both groups at both time points. D-dimer was not measured at on-CPB due to heparin interference with the assay. There were no differences in fibrinogen or D-dimer between the non-bleeder and bleeder groups at any time point, p = 0.1735 and p = 0.3809, respectively. Anti-thrombin inhibits thrombin and FXa, as well as other proteases of the coagulation cascade in the presence of heparin. It was approximately 45 to 50% of the adult plasma concentration at baseline and fluctuated slightly higher during surgery ([Fig. 3A]). The overall pattern of change mirrored that of total protein, but the anti-thrombin increase lagged total protein, suggesting consumption, particularly in on-CPB samples. There were no differences between the non-bleeder and the bleeder groups at any time point. Anti-thrombin TUG gel conformational analysis revealed primarily a fully active, virgin form at baseline ([Fig. 4]). At later time points, a rapidly migrating band that did not unfold, representing proteolytically inactivated anti-thrombin, as well as multiple higher molecular weight bands that did not unfold, representing polymerized and protease complexed anti-thrombin emerged ([Fig. 4]). These changes, most prevalent in on-CPB samples, were also present post-CPB and post-op. There were no identifiable patterns in anti-thrombin TUG gels consistently associated with non-bleeders or bleeders. Fig. 3 Change in anti-thrombin, antitrypsin, anti-plasmin and C1-inhibitor across surgery. Box and whisker plots as described in [Fig. 1] for plasma serpin concentrations at the four surgical time points as per cent adult plasma in the non-bleeder (black bars) and bleeder groups (grey bars) are presented. (A) Anti-thrombin was increased at post-cardiopulmonary bypass (CPB) compared with baseline and on-CPB, p < 0.0001 for non-bleeders; p = 0.0009 and p = 0.0386 for bleeders. (B) Antitrypsin was decreased at all three surgical time points compared with baseline, p < 0.0001 for the non-bleeder and bleeder groups. (C) Anti-plasmin decreased between baseline and on-CPB, p = 0.0006 for non-bleeders; p = 0.0285 for bleeders. 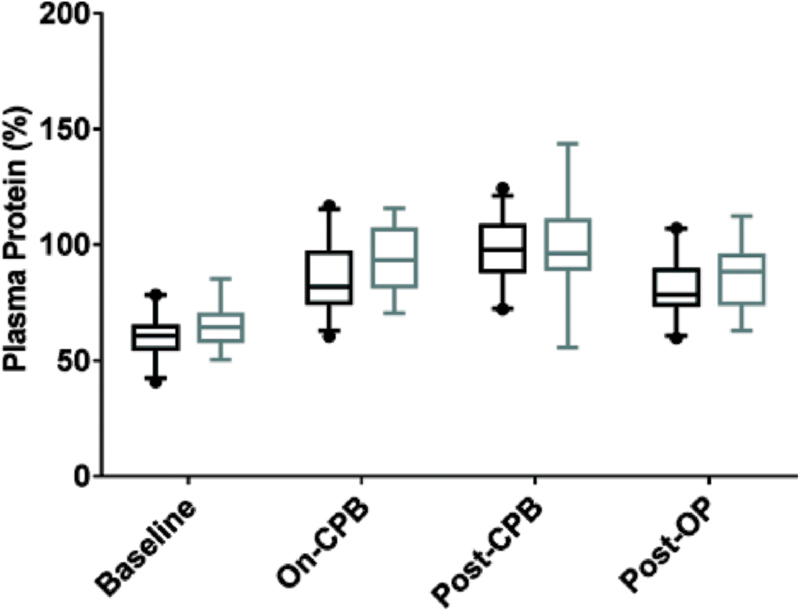 (D) C1-inhibitor increased at on-CPB and post-CPB compared with baseline, p < 0.0001 for the non-bleeder group at on-CPB and post-CPB; p < 0.0001 for the bleeder group at on-CPB and p = 0.0002 at post-CPB, but was not different from baseline at post-op, p = 0.0864 for non-bleeders and p = 0.2236 for bleeders. There were no differences between the non-bleeder and bleeder groups at any time point for any serpin, p > 0.1203 for all. Fig. 4 Transverse urea gradient (TUG) gel electrophoresis with Western blot to assess conformational stability of serpins across neonatal cardiopulmonary bypass (CPB). Each panel represents a single gel with migration from top to bottom and 0–8 M urea gradient from left to right. There were minor differences for different serpins at the various time points observed in some patients, but overall results were consistent. The most representative gels from individual neonates are presented. All serpins exhibited the virgin conformation at baseline. There are minor forms of anti-plasmin and C1-inhibitor that unfold differently (arrowheads) than the primary form. Other than anti-thrombin and C1-inhibitor, the serpins remained in virgin conformation across surgery. New conformations of anti-thrombin appeared in samples collected during surgery. 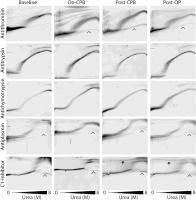 These include reactive site cleaved anti-thrombin present as a rapidly migrating band that did not unfold in 8 M urea (arrowhead), as well as multiple slower migrating bands, that represent anti-thrombin-protease complexes, or polymerized protein. A new form of slowly migrating C1-inhibitor, likely representing a protease-complexed form, was observed at post-CPB and post-op (arrows). Antitrypsin plasma concentration is over 1.0 g/L, higher than other plasma protease inhibitor. As a rapid neutrophil elastase inhibitor, it protects tissues from enzymatic degradation during inflammation. The neonatal plasma concentration was approximately 85 to 95% of adults at baseline and decreased by 20 to 40% over time during surgery (p < 0.0001; [Fig. 3B]), suggesting consumption. No differences in antitrypsin levels between the non-bleeder and bleeder groups were found. Antitrypsin TUG gel conformational analysis revealed only the fully active, virgin form across surgery ([Fig. 4]). Interestingly, in addition to the classical signature ([Fig. 5A]), three unique signatures were seen at baseline; a slightly less stable form that unfolded at low urea concentration ([Fig. 5B]), a form that migrated slightly faster following unfolding at high urea concentration ([Fig. 5C]) and a double heterozygous form combining these two less common forms ([Fig. 5D]). An association between the antitrypsin TUG gel baseline forms and non-bleeder versus bleeder group status was not identified. Fig. 5 Transverse urea gradient (TUG) gel electrophoresis and Western blot reveals unique unfolding signatures of virgin antitrypsin present in different neonates at baseline. (A) The classical signature; (B) A slightly less stable form that unfolded at low urea concentration (arrowhead); (C) A form that migrated slightly faster following unfolding at high urea concentration (arrowhead); and (D) a neonate heterozygous for the two variant forms (arrowheads). Anti-chymotrypsin is an inhibitor of neutrophil cathepsin G and limits tissue injury at sites of inflammation. Measurement of anti-chymotrypsin plasma concentration by ELISA was not performed, because we were unable to identify an antibody pair that worked consistently. Anti-chymotrypsin TUG gel conformational analysis revealed only the fully active, virgin form across surgery ([Fig. 4]) with no differences between the non-bleeder and bleeder groups. C1-inhibitor inhibits several proteases of the complement cascade. It was approximately 85 to 90% of the adult plasma concentration at baseline, increased to 45 to 75% in on-CPB and post-CPB samples, before returning towards baseline at post-op ([Fig. 3D]). There were no differences between the non-bleeder and bleeder groups across surgery. C1-inhibitor TUG gel conformational analysis revealed primarily the fully active, virgin form at baseline ([Fig. 4]). There were several minor bands on the C1-inhibitor TUG gels that were most apparent at post-CPB and post-op ([Fig. 4]). One band unfolded in a similar pattern to virgin C1-inhibitor and may represent a form that has undergone N- or C-terminal proteolysis or a form with altered glycosylation. There also were high molecular weight bands that did not unfold, a pattern consistent with circulating C1-inhibitor-protease complex and low level consumption. An association between the presence or apparent amount of C1-inhibitor-protease complex and bleeding status was not identified. TFPI, a Kunitz-type protease inhibitor, dampens early stages of a pro-coagulant response by inhibiting tissue factor, FVIIa in a FXa-dependent manner, and early forms of pro-thrombinase, the catalytic complex containing FXa and FVa. Plasma TFPI is present in the full-length form, termed TFPIα, and C-terminally truncated forms. Plasma total TFPI (TFPIα plus truncated TFPI) and TFPIα concentrations were measured across surgery. At baseline, total TFPI was approximately 20 to 25% the adult concentration with TFPIα representing approximately 10% of the total plasma TFPI ([Fig. 6A]). Total TFPI and TFPIα promptly increase two- to fourfold upon heparin infusion in adults. Heparin-releasable TFPI was similarly observed in neonates, as total TFPI increased over twofold between baseline and on-CPB. At post-CPB and post-op, it declined slightly but remained elevated at twofold over baseline. 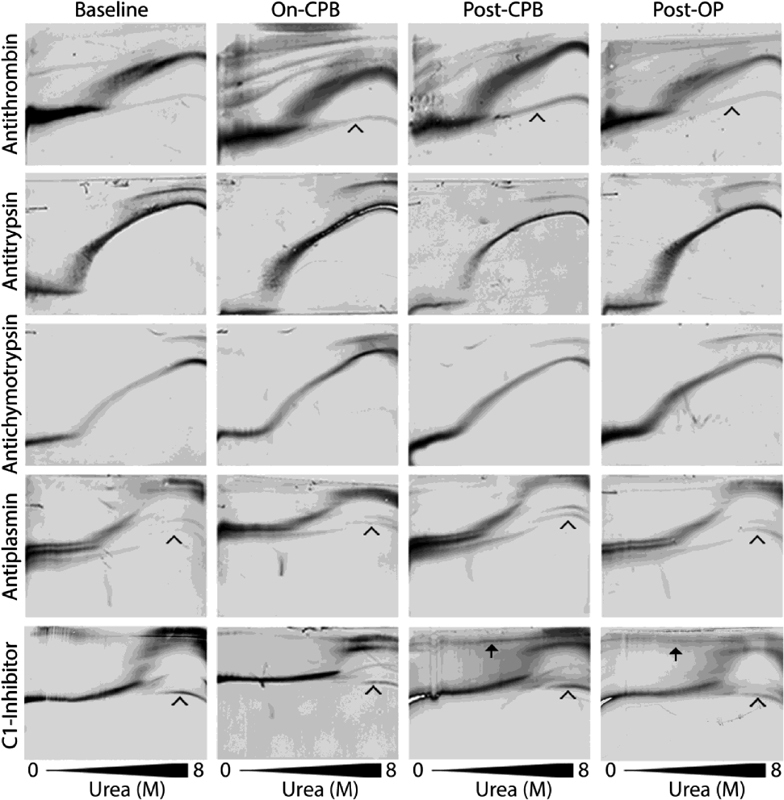 TFPIα increased fivefold between baseline and on-CPB ([Fig. 6B]). It then declined to about fourfold over baseline at post-CPB and twofold at post-op. Despite these large changes in plasma TFPI across surgery, there were no differences in the plasma concentration of either total TFPI or TFPIα between the non-bleeder and bleeder groups. TFPI Western blots ([Fig. 6C]) mirror the ELISA data with greatly increased band intensity in samples collected after baseline. Of note, the presence of a small amount of degraded TFPI apparent at post-CPB and post-op may partially explain the continued elevation of plasma TFPI following reversal of heparin with protamine in the post-CPB and post-op samples. Fig. 6 Change in tissue factor pathway inhibitor (TFPI) concentration and partial degradation across surgery. In panels A and B, box and whisker plots as described in [Fig. 1] with black bars representing the non-bleeding group and grey bars the bleeding group are presented. (A) Total TFPI increased over twofold in on-cardiopulmonary bypass (CPB) samples compared with baseline and remained twofold elevated across surgery, p < 0.0001. There were no differences in total TFPI or TFPIα between the non-bleeder and bleeder groups at any time point, p = 0.9353. (B) TFPIα increased fivefold in on-CPB samples compared with baseline and remained over fourfold elevated across surgery, p < 0.0001. There were no differences in total TFPI or TFPIα between the non-bleeder and bleeder groups at any time point, p = 0.1486. (C) TFPI Western blot demonstrates a marked increase in the amount of plasma TFPI after baseline. Degraded forms of TFPI were present in post-CPB and post-op samples (arrow). Physiological responses to the haemostatic stress of CPB were evaluated by examining changes in concentration and structural conformation of plasma protease inhibitors regulating the coagulation, inflammatory, fibrinolytic and complement cascades in neonates undergoing complex cardiac surgical procedures. TUG gel analysis identifies these different serpin conformations in plasma in a simple, low cost manner that requires only micro-litres of plasma. These analyses were used to obtain ‘snapshots’ of serpin conformational changes occurring across the cardiac surgical procedures. Although a decrease in fibrinogen concentration was not observed, large effects on the structural conformation of anti-thrombin were observed, indicating activation of the coagulation cascade. The heparin infusion occurring between baseline and on-CPB was associated with the accumulation of non-virgin forms of anti-thrombin in plasma. 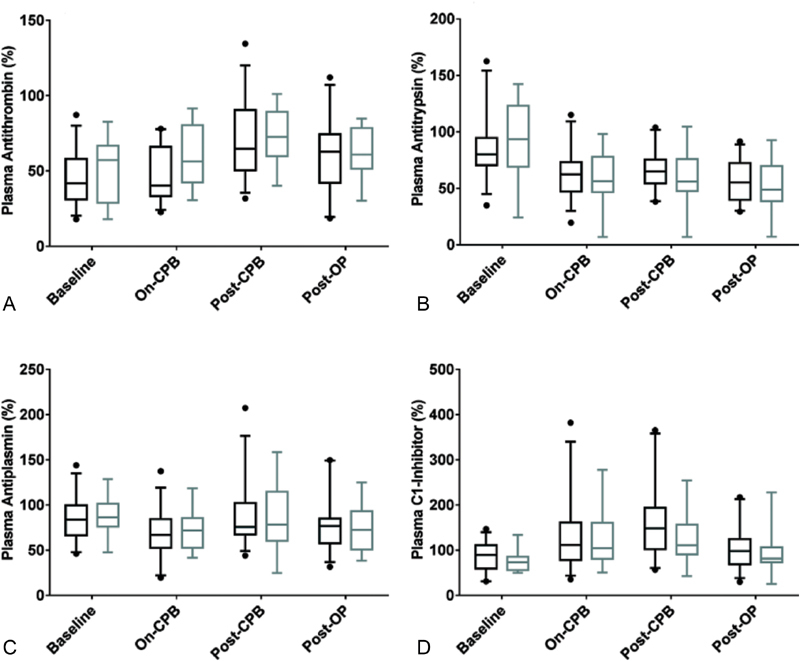 These remained following protamine infusion at post-CPB or post-op, suggesting continued activation of coagulation proteases at the end of surgery. However, no associations were identified between change in plasma concentration or structure of anti-thrombin and post-operative bleeding. Despite activation of the blood coagulation cascade, only minimal conformational change of other protease inhibitors was observed. Thus, based on serpin conformational change, there was no evidence for substantial CPB-mediated activation or cross-activation by coagulation proteases of other plasma proteolytic cascades in the neonates. Further, ample amounts of the virgin form of each serpin examined were present across surgery indicating that widespread or uncontrolled proteolysis did not occur, even in the patients experiencing bleeding. The presence of the inactive forms of anti-thrombin in on-CPB, post-CPB and post-op samples indicates that ELISA measurement of antigen likely over-estimates the active anti-thrombin in plasma. However, examination of the TUG gels revealed that typically 75% or more of the anti-thrombin remained in the virgin conformation and severe depletion of active anti-thrombin was never observed. These data suggest that the neonates had ample anti-thrombin, either endogenous or transfused, and would not have further benefitted from infusion of anti-thrombin concentrate. TFPIα is a heparin-releasable plasma protein in adults. The neonates had a similar response to heparin, as plasma TFPIα increased an average of fivefold between baseline and on-CPB. The neonates differed from adult CPB patients in that TFPIα remained elevated over twofold following protamine reversal in the post-CPB and post-op samples, while it returned to baseline in adults. Similar to adults, C-terminal degradation of a small portion of circulating TFPIα occurred during surgery. One possible cause for the elevated TFPI remaining in the circulation would be incomplete protamine reversal of heparin. However, it may also result from a unique interaction between neonatal TFPI and vasculature that is not present in adults. Further studies are needed to understand this interaction. TFPI is a Kunitz-type protease inhibitor with inhibitory domains defined by disulphide bonds; therefore, unfolding transitions were not examined using TUG gel conformation analysis. While the elevated plasma TFPIα at the end of surgery is expected to increase plasma anticoagulant activity, it remains of uncertain physiological significance because it was not associated with post-operative bleeding in the neonates. Although previous studies have found activation of complement, and inflammatory cascades in paediatric CPB, there was remarkably little change in the concentration or structural conformation of the serpins regulating inflammatory, fibrinolytic and complement proteolytic cascades. Plasma concentrations of antitrypsin, anti-plasmin and C1-inhibitor each remained at 60% or more of baseline with only small amounts of non-virgin conformations observed in TUG gels, providing little evidence for extensive unregulated cross-activation of non-coagulation proteolytic cascades by coagulation proteases or cascade activation by exposure to artificial surfaces in the bypass pump. Of the changes observed, perhaps the most relevant was the plasma antitrypsin concentration. Antitrypsin is an acute phase reactant and, therefore, may have been expected to increase across surgery. Instead, it decreased 20 to 40% from baseline, suggesting the possibility of consumption. It is possible that there was rapid clearance of antitrypsin-protease complexes from the circulation, as only the virgin form was observed on TUG gel conformational analysis, but antitrypsin-protease complexes are cleared from the circulation by the same receptor as anti-thrombin-protease complexes, which were observed in the TUG gels. Thus, the mechanism for the decrease in the plasma antitrypsin concentration remains unclear. In contrast to antitrypsin, C1-inhibitor, which also is an acute phase reactant, was increased in on-CPB and post-CPB samples. There was a small amount of protease-complexed C1-inhibitor in samples collected after baseline, but over 90% remained in the virgin conformation. The increase in C1-inhibitor observed here contrasts with a previous study where a significant drop was observed in < 12-month-old patients undergoing CPB. However, several of these babies experienced capillary leak syndrome, which is associated with the decreased C1-inhibitor and did not develop in neonates studied here. A limitation to this study is that excessive bleeding in some patients with post-operative bleeding began in the operating room, as evidenced by the increased number of blood products they received during surgery. To account for this, the analyses comparing protein concentrations in non-bleeders to bleeders were adjusted for the amount of total protein in each plasma sample to account for the effects of transfusion, but this did not alter the changes observed for the individual plasma protein concentrations. Thus, while transfusion produced a major change in plasma protein concentration at the beginning of surgery, the transfusions administered in response to patient bleeding that occurred primarily in the post-CPB period had minimal impact on plasma protein concentration. However, the intra-operative transfusions may have masked significant declines in the plasma protease inhibitors among the bleeding patients. Similarly, the transfusions may have impacted the conformations of the serpins observed on the TUG gels, particularly the virgin forms, which are in FFP. However, the consistent presence of non-virgin forms of anti-thrombin across the surgical procedure in all neonates suggests that if other serpins existed in non-virgin conformations, they also would have been observed on the TUG gels. None of the protease inhibitor plasma concentrations or conformational changes were associated with post-operative bleeding in the neonates, reflecting the multiple possible causes of bleeding in this population with a complex disease undergoing a complex surgical procedure. Direct comparisons of the findings presented here to those of previous studies of neonatal or paediatric CPB are difficult due to variations in study protocols and patient management. These include differences in the age of the patients enrolled, exclusion criteria, priming solutions and differences in transfusion of blood products, colloid solutions and recombinant anti-thrombin. Therefore, our findings and conclusions about cross-activation of plasma proteolytic cascades by coagulation proteases and the effects of changes in plasma protease inhibitor concentration and conformation on post-operative bleeding following neonatal CPB are applicable to patients treated with a transfusion protocol similar to that used here. What is known about this topic? Exposure of blood to artificial materials during cardiopulmonary bypass can activate coagulation, complement and inflammatory pathways. Serpin conformation can be readily detected using transverse urea gradient gels and serve as a plasma biosensor for proteolytic cascade activation. Tissue factor pathway inhibitor is a heparin-releasable protein. What does this paper add? Blood samples from 44 neonates were obtained at four times points during cardiopulmonary bypass surgery. Coagulation was activated as evidenced by changes in the conformation of anti-thrombin, but extensive cross-activation of other cascades was not observed. Plasma tissue factor pathway inhibitor increased upon heparin infusion and remained elevated following protamine administration. However, it was not associated with bleeding in this population. A.E. Mast receives grant support from Novo Nordisk. The other authors have no conflicts to declare. S.A. Maroney: designed research, performed experiments, interpreted data and wrote the manuscript. J.A. Peterson: designed research, interpreted data and wrote the manuscript. W. Zwifelhofer: performed experiments. N.D. Martinez: performed experiments. K. Yan: interpreted data and performed statistical analysis. R.S. Bercovitz: designed research and interpreted data. R.K. Woods: performed surgery, designed research and interpreted data. A.E Mast: designed research, interpreted data and wrote the manuscript.